Oh wow- if you were a dedicated Sassy Magazine fan when the mag was in production and didn’t get a bit teary-eyed perusing Tavi Gevinson’s hotly-anticipated site Rookie, your heart is totally black and not even in a cool, sort of goth way. My love of and credit to Sassy as a massive professional and personal influence is well-documented, and when fashion and web wunderkind Tavi Gevinson looked like she would take up the torch and revive the Sassy culture for the teens of today- this time on the web- fans like myself who never really got to say goodbye to the ‘zine-like publication that felt like a best friend were almost across the board wetting our pants with excitement. Initially, it seemed Gevinson would team up with Sassy‘s own Jane Pratt- who went on to create the sadly blander and now retired Jane magazine- to launch the project. The Pratt partnership did not come to pass as Gevinson wanted to maintain control over the site, but no matter- a cursory look at Rookie reveals that she indeed appears to have captured the Sassy feel in the project- one seemingly germinated by the teen’s fortuitous discovery of a stack of old Sassys. …Rookie is not your guide to Being a Teen. It is not a pamphlet on How to Be a Young Woman. (If it were, it would be published by American Girl and your aunt would’ve given it to you in the fifth grade.) 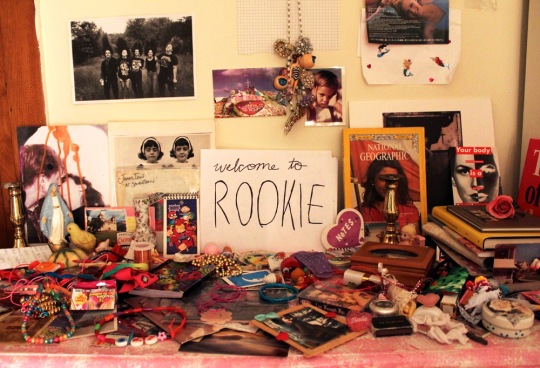 It is, quite simply, a bunch of writing and art we like and believe in… Rookie is a place to make the best of the beautiful pain and cringe-worthy awkwardness of being an adolescent girl. When it becomes harder to appreciate these things, we also have good plain fun and visual pleasure. When you’re sick of having to be happy all the time, we have lots of eye-rolling rants, too. Which totally could have come from the pages of Sassy if Facebook existed back then. Rookie opens optimistically with a seven-page missive about The Smiths, a rumination on knee-socks and a spread on 50’s style fashion for back to school. You can check Tavi’s new blog- which is totally not but really totally is Sassy 2.0 (sorry, Tavi!) over at RookieMag.com.